I know, I know, Rolex is over. But think about 2015! In the meantime, I'm waiting for the JoJo sox to arrive to do the Sox giveaway. And the orange vest giveaway is over -- the lucky winner will send a photo soon! #4. James Wofford. He’s one of the guys you admire and fear--truly the George Morris of the eventing world. He’s quick with the one-liner and has the scoop on all of the competitors. Every April in the Chronicle, Wofford reviews the Rolex lineup, and I pour over that (and the whole issue) on the plane ride to Rolex. People at Rolex are chatty, I want to at least SOUND like I know what I’m talking about. Wofford’s summary is a Cliffs Notes for people like me. Note the Who Dat award, the up-and-coming rider no one (except Wofford) knows will impress. I love to read the personal stories of every rider, so I can tell Bob who we like and why we’re rooting for them. #3. Lexington Airport. If your passion for horses sometimes make you feel like an outsider, when you arrive in the Lexington airport you’ll know you’re home, where horses are everyone’s passion. Panoramic floor to ceiling images of horses line the walls of the airport walkways. 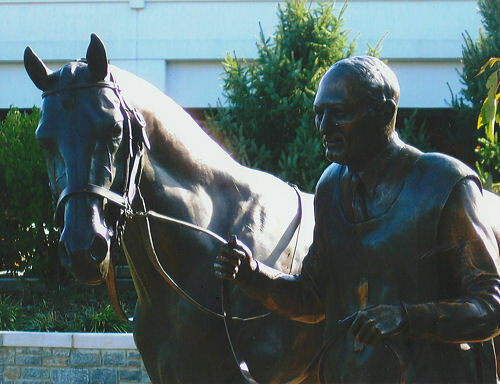 Exit the doors and head for your rental car, where you can admire a statue of a groom holding a horse. You haven’t even seen the city, but you will long to live in Lexington.